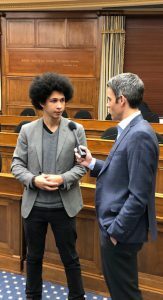 Aji Piper, one of 21 young plaintiffs in the constitutional climate lawsuit Juliana v. United States, being interviewed after his testimony. He is one of 21 plaintiffs in a lawsuit that claims young people will lose their constitutional right to life if the government does not take action to protect the environment. “I am here to speak to you, as a young person, on the greatest issue of our time—climate change,” he told the committee. 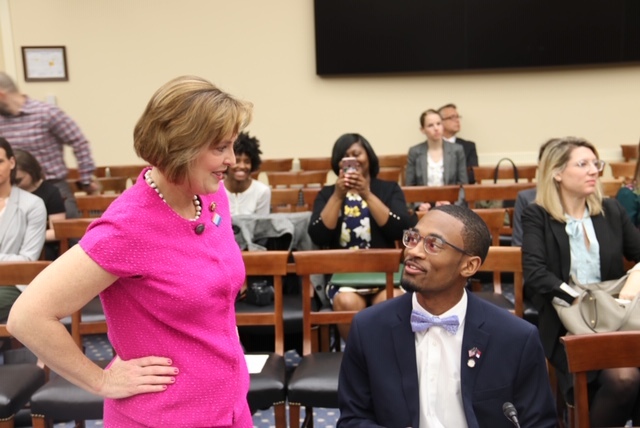 Florida Rep. Kathy Castor, the Democrat chairing the committee, called reducing carbon emissions a top priority. Rep. Sean Casten, D-Ill., said Congress has had “a bipartisan consensus to do nothing” for decades. Florida Rep. Matt Gaetz, a Republican called Wednesday for a reduction in global carbon emissions at press conference, taking a different approach than the Green New Deal supported by many Democrats. His plan is based on the premise that U.S. industries already have reduced greenhouse gas emissions and the government should support further technological advances in clean energy by reducing regulation on those industries and investing in new technologies. Piper called the hearing a “first step” in the crusade for congressional action on climate change; Casten urged the young activists to continue to push Congress and the rest of the federal government.